Tags: 2017 WSOP, Daniel Ott, Scott Blumstein. 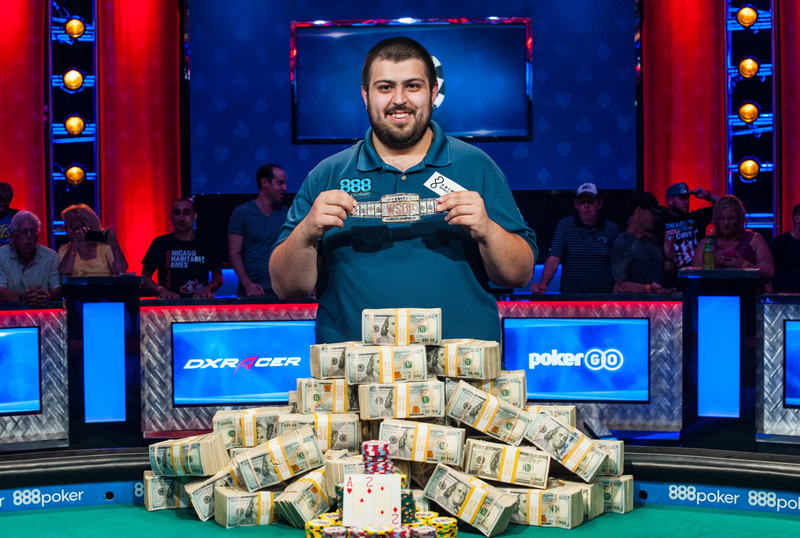 The poker world crowned a new world champion this weekend, as USA's Scott Bluemstein took down the 2017 World Series of Poker Main Event for $8,150,000 and the gold and diamond covered bracelet! It was the first time Blumstein played the Main Event. It was a memorable one to say the least, as he took the chip lead on Day 7 and led the final table almost from start to finish! Hand #246: Scott Blumstein limped from the small blind and Dan Ott bet 8 million. 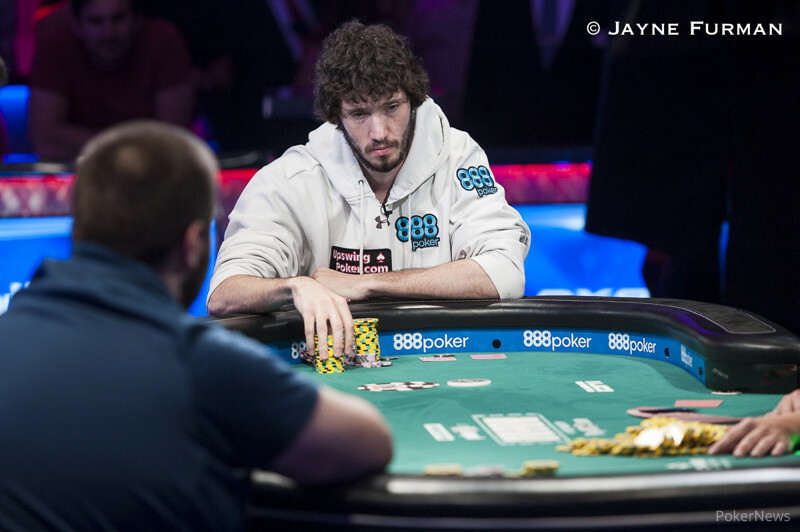 Blumstein moved all in and Ott, after a minute of thinking, called with his remaining 55 million chips. 7 and Ott picked up a straight draw. The river was the 2 and Blumstein's rail started celebrating! Blumstein had hit the miracle card to secure the Main Event title, while Ott had been eliminated in second place for a $4,700,000 payday. An understandably emotional Blumstein struggled to get the words out when asked by WSOP reporters how it felt to be the champion of the 2017 Main Event. "I'm still in shock. I thought I would get even more emotional that what I got in real time but it's just the best feeling, I can't even put it into words." 2017 WSOP Main Event: 27 Players Left - 2015 Bracelet Winner In The Lead! 2017 WSOP Main Event: FINAL TABLE IS SET! 19 comments for "Scott Blumstein Wins The 2017 WSOP Main Event! " Congratulations to the champion wsop 2017, although it was not my favorite and even my bets were for the Argentinean rooms that did a good role and made history, well congratulations again for the champion that celebrated 2 of hearts on the river as if they were aces .. lol It was for him and only him. The truth is that Scott has played very well to win this tournament and the bracelet, in addition to connecting all the cards he proposed, he deployed a very solvent and aggressive game and if it accompanies him luck was almost unstoppable, a fair winner. So another WSOP main event finished and we have new champion!he won bracelet and great amoutn,over 8 million $ and what to say then congratulation!hope that soon we will see this at tv and how whole tournaments was! Deuce of Hearts on the river changed everything! Congratulations to Scott Blumstein on being crowned champion of the 2017 WSOP main event! Dreams for success rarely materialize without dedication, perseverance, passion, and hard work combined to make it a reality. With his huge chip lead at the final table this was the most likely outcome. But even then, the tourney must still be won. So congratulations to Scott Blumstein for winning the tourney and the bracelet. kinda sick to see a winning hand is yet again a hand that was the weaker hand and a fcukin miracle river decided the day. man this blumstein dude was running hot throughout the while tournament, it really helps to have luck on your side when it matters most and not in some lame mtt. A first time that someone played the main event, and took it down. To riches from just one tournament. And at least in this photo, we can see the winner with all the money stacked on the table. Gratz to the new WSOP champion of the Year 2017! What a dream to win the bracelet from the main event and a cash prize over 8 million $$$. Perhaps we hear more about this player in the next future, but to win the main event at the first time was great for him. now best thing for him will be to invest money somewhere and to enjoy in rest of life in this and maybe to play online poker!its big amount and he is not old,so just find some hobby and enjoy with family! I just watched the replays of the final table of the 2017 World Series of Poker Main Event. Scott Blumstein audaciously firing three barrels with king-high against Dan Ott — that was probably the most memorable moment in this year's event.